Let’s get to the 7 best resorts on Kauai. If you enjoy this post, you might also enjoy the 10 best resorts on Maui and the 7 best resorts on the Big Island. If you’re trying to decide where to stay, you can check out which Hawaii island is best. If you’ve decided to stay on Kauai, check out my top 10 things to do on Kauai. If you want to stay in a luxury resort, but love condo-style accommodations, you’re in luck! The Koloa Landing Resort has the perfect mix of resort amenities and large luxury villas. The pools are some of the best on the island. While it is not beach front, you can quickly walk to shops or the beach. The Koloa Landing Resort is my top recommendation for families staying on Kauai. It’s near the beach and shopping, has options for studios, 2 and 3 bedrooms, and amazing pools. What more could you ask for? In Kauai, it rains a lot in the winter, especially on the North Shore. The grounds of the resort are beautiful and it’s a quick walk down the hill to the beach. We tend to choose ocean view rooms, but choose a mountain view at the Hanalei Bay Resort, it’s absolutely stunning! Also located on the North Shore, the Princeville Resort (formerly the St. Regis Princeville) is one of the best resorts on Kauai, if not the best. 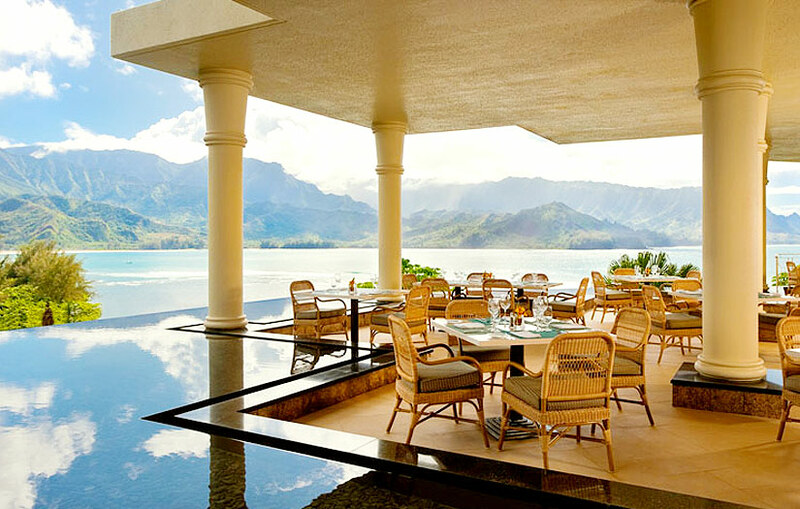 It has the most stunning views of any resort on Kauai and is one of the most luxurious. 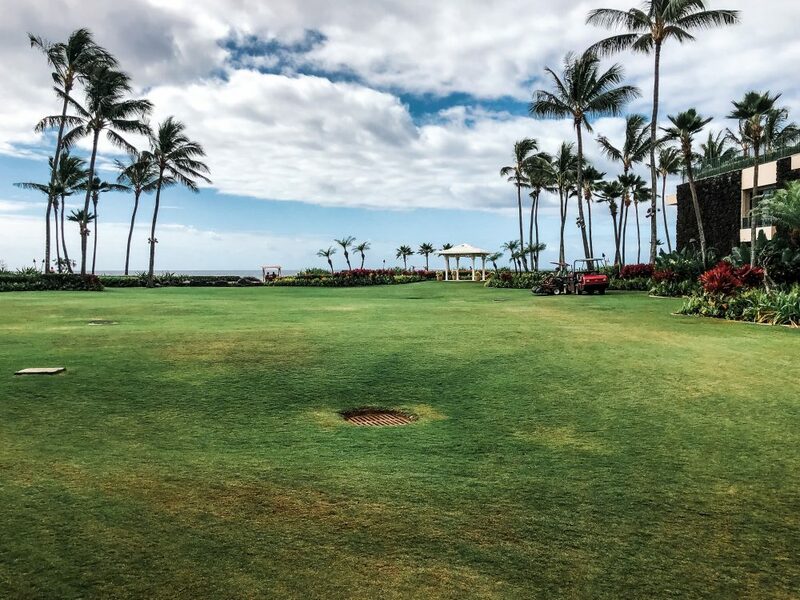 If you’re a golfer, you’ll love the Princeville Makai golf club, one of the highest rated golf course in all of Hawaii. 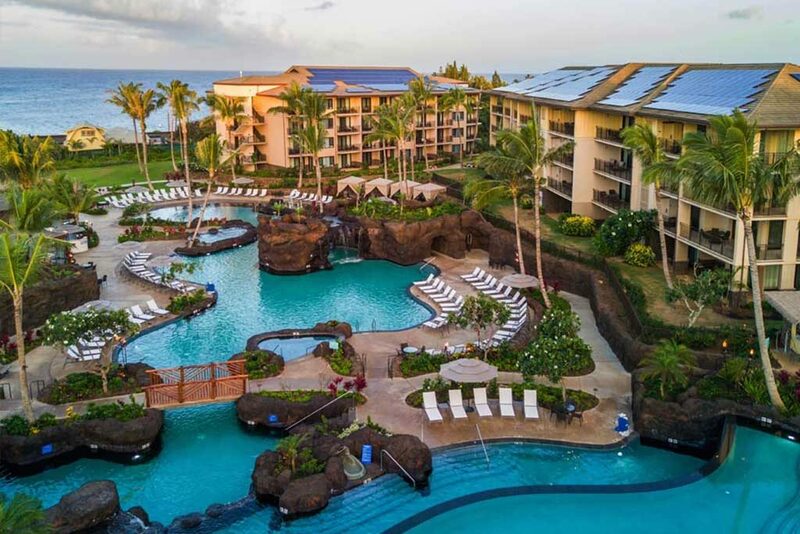 Located in the sunny south side of Kauai, the Sheraton Kauai is located on the famous Poipu Beach. 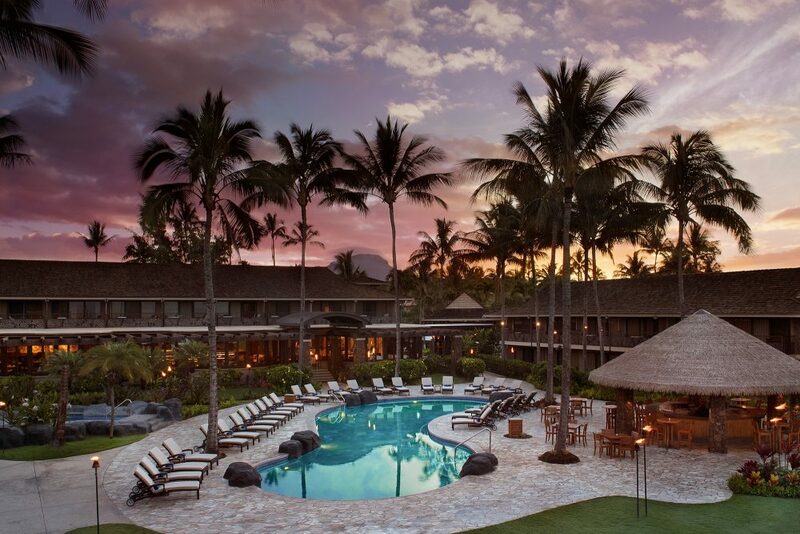 If you’re traveling in the winter, the south side of Kauai is the perfect place to stay. You’ll also enjoy the resorts signature restaurant, RumFire Poipu Beach. Also located on Poipu Beach, the Ko’a Kea Hotel and Resort is one of the highest rated resorts on the island. If you’re looking for an intimate and romantic beachfront boutique resort, I highly recommend the Ko’a Kea. This resort is perfect for honeymoons, anniversaries and more. At 604 rooms, the Grand Hyatt is the largest resort on Kauai and the third largest on all of the Hawaiian islands. Located in the popular resort area of Poipu, the Grand Hyatt has the perfect mix of resort amenities but is close to many adventure activities on Kauai. About half of the rooms have an ocean view of some sort, which is what many of us visit Hawaii for. The Grand Hyatt has the best kids club on Kauai and is home to four birds including three macaws and one parrot. With several on-site restaurants and nightly entertainment, you won’t have to leave the resort often, although you should because it’s Kauai and you’ll want to explore. The Grand Hyatt has three pools, two larger pools including a lagoon pool and one adults-only pool with a nearby bar. One more bonus, every single room has a lanai! 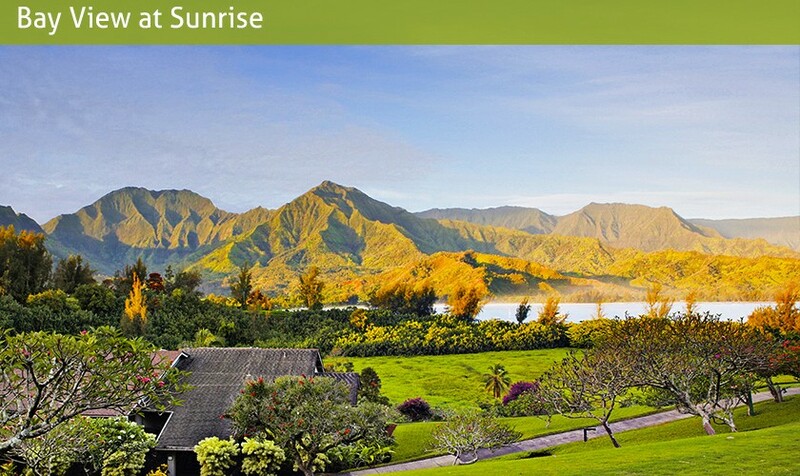 Located in Lihue, the Kauai Marriot Resort is beachfront with stunning views. They have one of the largest pools in Hawaii, and it’s heated! You might not think that a pool needs to be heated in Hawaii, but it can get a tad chilly (by Hawaii standards) in the winter so this is a great feature. The Kauai Marriot Resort also boasts the longest golf course in Hawaii, a Jack Nicklaus signature golf course. The resort is also conveniently located near both the port and the airport and has an airport shuttle if you don’t rent a car. I do recommend renting a car in Hawaii, but it’s nice to have a shuttle if you haven’t rented one yet. While it’s not a resort, we recently stayed at the ISO on our last-minute trip to Kauai. My first choices weren’t available, so we decided to give the ISO a try. I read in Hawaii magazine that it was the editors choice for the best boutique hotel, so I wanted to check it out. I’ll write a full review later, but I will say that it’s a great place to stay if you’re on a budget and looking for a place to sleep. Even though they call it a resort, it’s really more of a hotel with a few small resort amenities. I love the daily yoga (including in the small resort fee) and they had a free breakfast. As far as breakfast, we skipped it because it was very limited but it might be nice to grab and go if you’re traveling with kids. 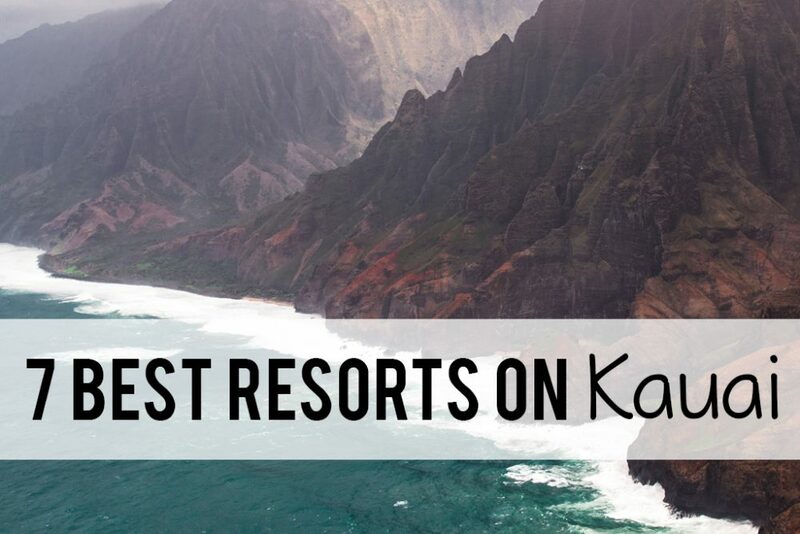 I hope this list of the best resorts on Kauai was helpful! 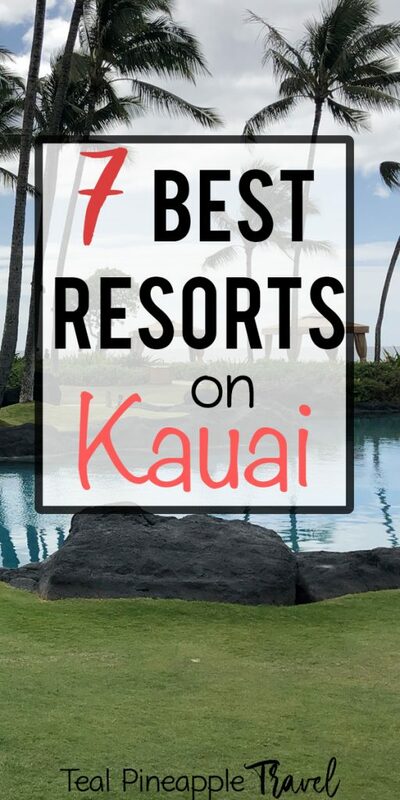 I hope that this list of the 7 best resorts on Kauai was helpful. 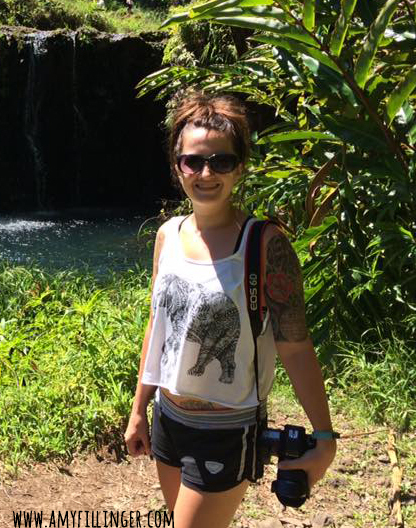 If you’re wanting to visit the beautiful garden isle, I’d love to help you plan your trip! 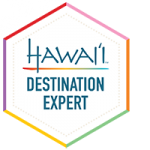 I am a Hawaii destination specialist and can help you plan your Kauai vacation from start to finish. Creating your custom vacation doesn’t cost anything extra, so why not leave the planning to an expert? Check out this post to see the benefits of working with a travel agent, or feel free to contact me today with any questions. Ready to start planning? Fill out this Custom Travel Request and let’s get started planning your Kauai dream vacation. Dreaming of Hawaii but not ready to plan your vacation yet? Sign up for my weekly newsletter! I send tips and tricks along with the latest travel news and deals. I’ll be there once you’re ready to plan your vacation.